Until now, I never thought much about it. Sure, I live with a little traffic rumble, the occasional helicopter humming overhead, and ambulance sirens wailing in the distance — but the volume never really registered. Until I visited Yellowstone National Park in winter. I’d always resisted a wintertime outing to our nation’s first national park. I’m passionate about outdoor adventure, but truth be told, I am increasingly nature’s fair-weather friend. I don’t like to be cold. But, on this January day, I quickly learned that it’s better to layer up and lean in to Old Man Winter than miss out on all Yellowstone has to offer in this season less traveled. The lush silence was enough to make me want to whisper, to stifle random commentary, and to just be in this pristine wonderland. The crunch of boots on packed snow, the gurgle of a stream under broken ice, the sudden burst of a geyser: Each decibel took on a rich quality in the absence of the everyday din. This, from one of my traveling companions, as we lumbered along the snow-covered road inside the cozy snow coach. Our merry band of nature lovers was bound for Old Faithful Snow Lodge, named for the park’s famous geyser. It’s one of two lodging options inside the park boundaries that are available during the winter months; the other is Mammoth Hot Springs Hotel. We had spent much of the day in the expansive Lamar Valley, often called the American Serengeti for its wide swath of landscape where elk and buffalo roam, as well as the occasional wolf. According to our guide, it offers the visitor’s best chance of catching a glimpse of the elusive gray wolf — canis lupus — especially in winter. Aided by spotting scopes and the advantage provided by my long camera lens, I scanned the open space and far hillsides for the most treasured of sightings. We had entered the park on the north side, crossing under the iconic Roosevelt Arch. Twenty years ago to that very day, Jan. 12, 2015, a horse trailer reportedly came in under the same arch, transporting the first 8 of 31 gray wolves from Canada. While this would mark the official reintroduction of wolves into the park after a seven-decade absence, it was both the welcome result of careful planning and preparation — and the continuation of a complex battle between environmentalists, on the one side, and ranchers, farmers, and outfitters on the other. Many within the latter group believe wolves are a threat to their way of life and to livestock. “It is difficult to be enthusiastic about the increase in the wolf population when their existence is a threat to your livelihood,” explained Tom Swanson, a third-generation Montana rancher whose cattle graze just 35 miles north of the park border. According to the Greater Yellowstone Coalition, proponents of the wolf reintroduction hoped to eventually build the population to 300. Current estimates, which have far exceeded expectations, put 80 wolves in the park, 450 in the Greater Yellowstone Ecosystem, and as many as 1,700 in the Northern Rockies. On our expedition, we were thrilled to see one. Our guide nudged the snow coach onto the side of the road, as our group maneuvered to capture images with our cameras while hoping to stow the memory in our mind’s eye for future reference. With the icy Firehole River as a buffer, the burly male appeared unfazed by our presence a mere 50 yards away. We watched in awe as he stepped in and out of the river, intermittently feasting on an elk carcass splayed on the far bank, as a handful of ravens hung back, hoping to sneak a few scraps. No doubt we would have treasured this late afternoon sighting on any given day. But somehow, given the anniversary, it felt like a gift. The next morning, our group opted to pop on cross-country skis and slide our way to a backcountry gem: the Lone Star Geyser. Yellowstone contains nearly 10,000 geysers, which are approximately one half of the world’s hydrothermal features. We swooshed the two and a half miles along the trail, gliding atop a few inches of fresh snow and aside a different stretch of the Firehole River. Along the way, our naturalist pal, Emily, shared her bounty of knowledge, identifying small tracks leading into and out of the forest. Then, with the geyser area in sight, I could hear Lone Star sputter before shooting a plume of steam some 40 feet into the air. “What perfect timing!” hooted one member of our group. And when I didn’t think the day could get any better, the sun peeked through the clouds and a rainbow appeared, arcing across the mist spewed by the steaming eruption. Seriously. 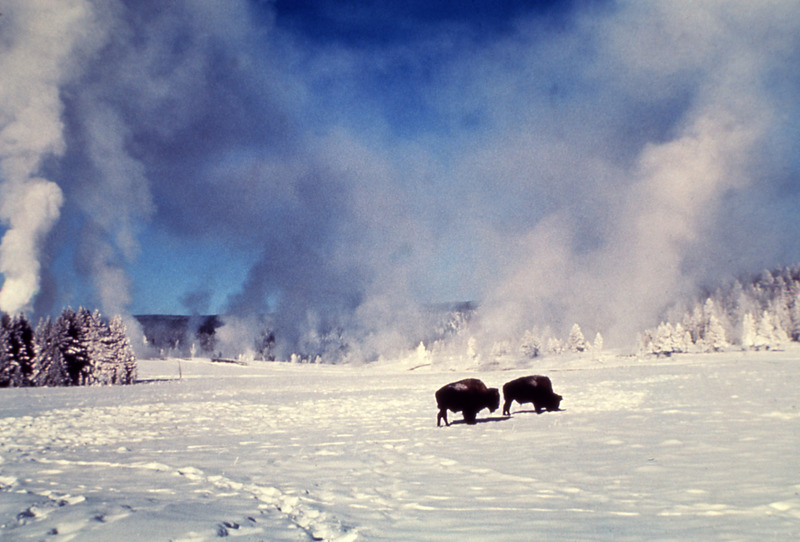 When it comes to Yellowstone, Old Man Winter knows how to warm a girl’s heart. IF YOU GO: www.VisitMt.com; Yellowstone Lodges.